Here is the latest collection of best truth or dare questions for 12 year olds. Kids will like these questions a lot. It is very common for kids to play the truth or dare game when they are bored. Kids need very good and clean truth or dare questions to play with their friends at schools and parties. 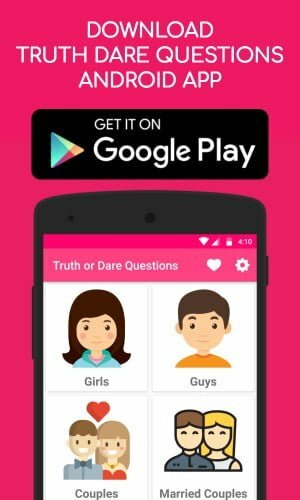 If you are looking for best truth or dare questions for 12 year olds, then you are at the right place. Here is the crazy collection of truth or dare questions for 12 year olds kids. Try these truth questions for 12 years olds when you choose the truth. These questions will turn interesting when you started playing. How many times your mom beat you? Have you ever try to wash your own clothes? Have you ever stolen a snack from your fridge without knowing your mom? How many times did you cry for ice cream? What was the last time you forgot to brush your teeth? Do you ever forget to clean your hands after taking your meal? Did you ever try to impress any girl/boy in your school? Have you ever tried to help your friend in exams and get caught? Have you ever lied to your mother about bunking school? If you hand $100 in your pocket, what you do with that money? Have you ever entered into your opposite gender’s toilet and shout loudly? How many friends are there in your gang? Have you ever farted while having lunch with your friends and get caught? Do you have fear of crackers? Do you really do your homework on your own? Have you ever rob your friend’s lunch box? What was the worst dress you wear on your birthday? Have you ever break valuable things when your parents are not there in your home? At what age you start eating on your own? How many times do you take permission for the toilet in a day? Do you like to have a pet along with you in your home? Have you ever slipped your underwears while you do your shower? Have you ever steal money from your parent’s wallet? What is your favorite homemade dish? Do you like to drink milk every day in the morning? Have you ever cried while watching an emotional movie? How you peed in swimming pool or while taking your bath? What is the dirtiest thing you did to your friend and get caught? How many chocolates you’ll eat at a time? Do you brush your teeth today? Have you ever tried skateboard and fell down? How you ever had your shower without using soap? How will you react if your room light will switch off suddenly? At what age you stopped peeing in your pants? How many birthday gifts you received last year? How often do you bite your fingernails? Have you ever lied about age? That’s all for today. Hope you like our list of best truth questions for 12 year olds. Let’s check the second half of truth or dare questions for 12 year olds. Try these dare questions for 12 year olds when you choose a dare. These questions will turn interesting when you start playing the game seriously. Dance crazy on the floor. Act like a 70 years old man/woman. Walk like a pregnant lady. Do 15 sit-ups, every time you have to touch your elbows to the floor. Say 20 multiples of 12 within a minute. Say alphabets backward two times continuously without mistakes. Keep eye contact with your teacher up to the end of their class. Pour one full mug of soap water on your head. Behave like a goat which is ready to die. Imagine you have a skipping thread on your hands and start playing skipping. Drink two full bottles of water at a time. Remove your shoes and put your leg in toilet sink. Act like a sleepy person in the middle of the class. Act like a love failure person with a water bottle in your hands. Hug a pillar for 60 seconds. Rub your armpits with your fingers and smell your fingers. Lick your friend’s nose using your tongue. Go and sit under a water tap along with your clothes until your entire clothes turn wet. Act like your favorite cartoon character. Act like a monkey and keep jumping for 2 minutes. Suppose you’re a father/mother of a newborn baby, now show how you express those feelings. Tie your shoelace together and do backward walk for two minutes. Lick and drink one full water bottle like a dog. Eat 10 end pieces of bread. Make sounds like a donkey and a pig. Take a white paper and draw your face blindfolded. Stay like a statue, if anyone comes close to you make them fear. Think you’re in a very cold place with your crush, now act how you kiss your crush while your body is so shivering. Turn your lips like a fish for 2 minutes. Say any five non national language alphabets. Sing any song and salsa dance at the same time. Remove all your extra items from your body except regular clothes. Spin for 30 seconds and run till for 1 minute. Close your eyes and paint your fingernails. Start any five raw vegetables. Eat one full hand of boiled rice. Take out all your money from your pockets/wallet and buy snacks to your friends with that money. Rub any one of your friend’s legs using your hands. Slap your hands using any one of your friend’s shoes. Hope you like our list of best truth or dare questions for 12 year olds. If you have any other truth or dare questions in your mind, please comment below and we’ll update our collection.